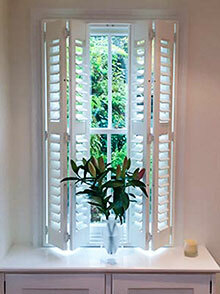 Plantation Shutters custom made for you. 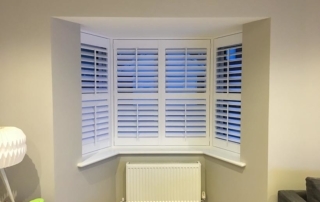 A single bank of louvres from top to bottom without interruption is ideal for more average or smaller height windows and allows maximum light to pass through. 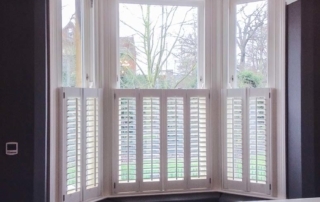 However, panels over a certain height will require a mid-rail for structural stability, particularly on tall sash windows or patio doors, this has the benefit of allowing you to independently manoeuvre the top and bottom sets of louvres. 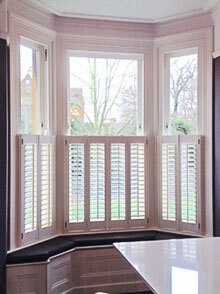 A mid-rail can also be positioned to suit any existing features on your windows such as top opening windows. 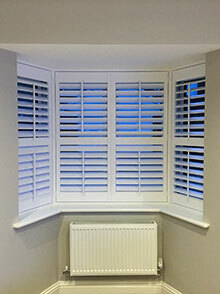 For larger images and a full selection of other styles available, visit our Picture gallery page. 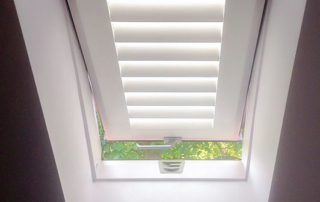 Tier-on-tier panels are set within a single frame, but allow the user to open either the upper panels or lower panels independently of the other, so offering greater flexibility. 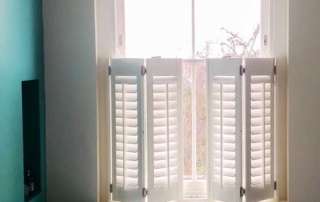 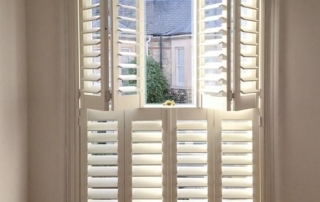 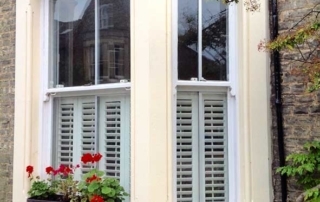 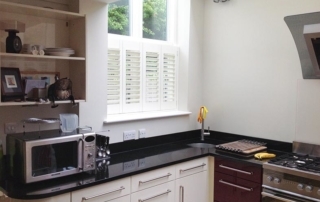 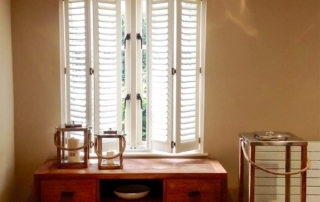 This style of shutter is particularly well suited to traditional Victorian sash style windows. 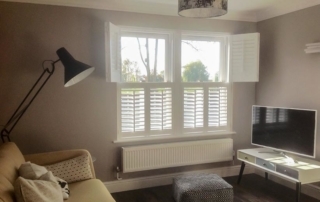 Consider smaller width panels if you are wanting to fold back top panels as they will protrude into the room less, particularly if you have a bay window. 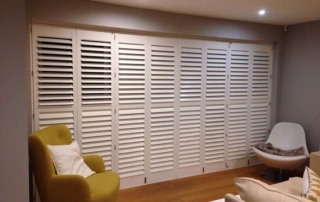 (We would highly recommend one of our timber ranges for tier-on-tier). 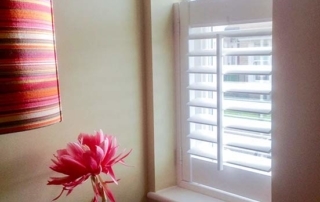 Cafe style panels are particularly suited to sash or split height windows where the user wishes to have more privacy at the lower section of the window, but doesn’t wish to block out the light all together, thus leaving the window completely clear and unobstructed at the top. 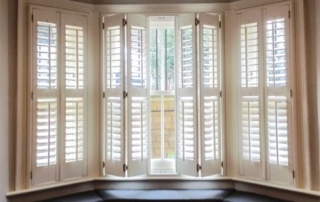 A great option if your house is close to the street with lots of passersby. 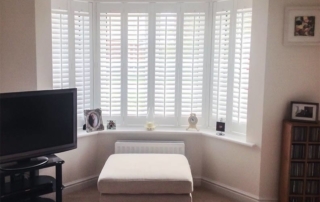 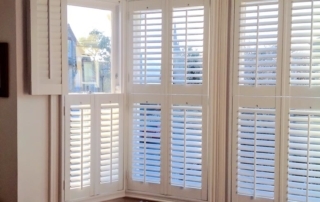 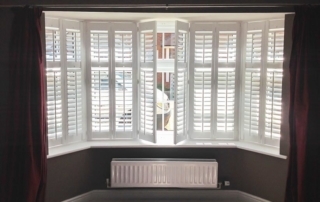 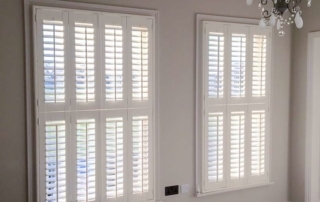 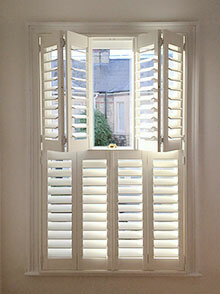 Shutters work incredibly well on any bay window and really do make a room look wider. 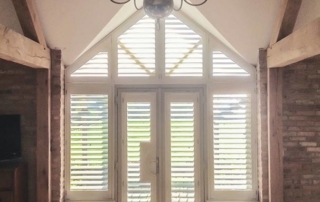 Available for box bays, angled bays and round bays, our solid timber bay posts can be custom made to any angle. 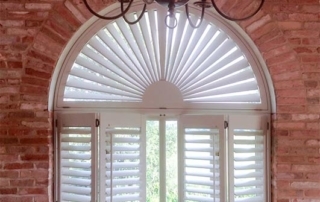 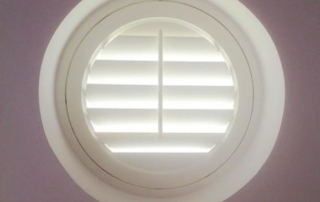 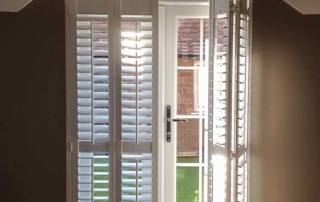 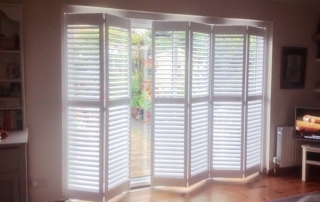 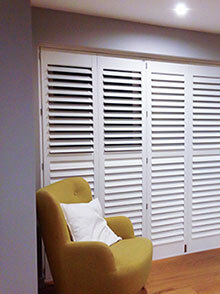 Shutters are an ideal solution for those difficult to dress windows whether they are circular, arched or angled. 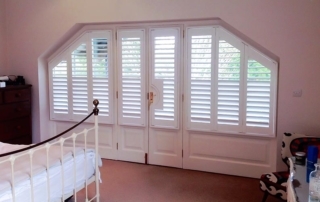 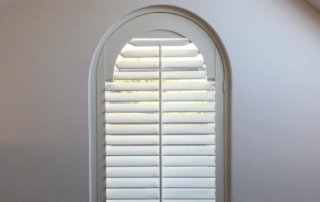 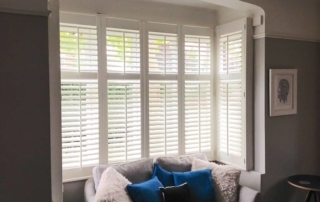 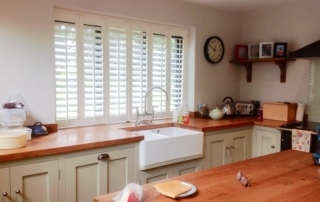 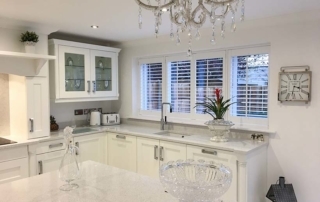 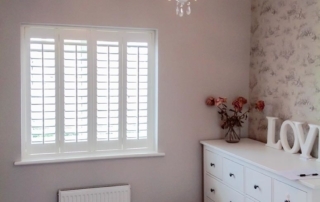 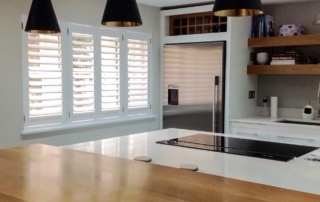 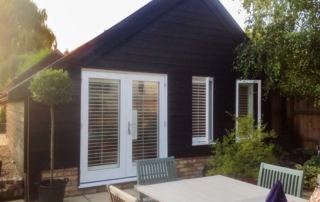 (any curved shutters can only be manufactured from one of our premium timber ranges, however it is possible for angled shutters to be manufactured from any of our ranges). 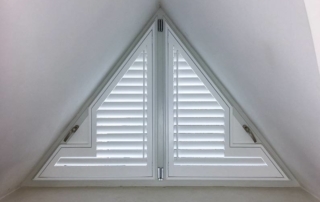 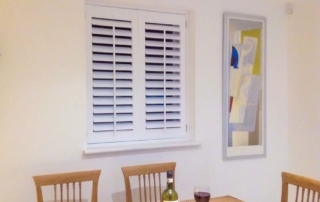 We also have a range of timber shutters to suit Velux or Fakro windows. 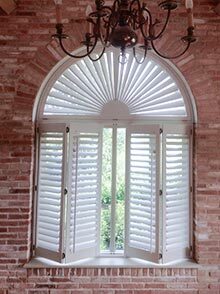 Wide patio shutters are available on a standard frame or a track system and will require a fixed mid-rail for structural stability. 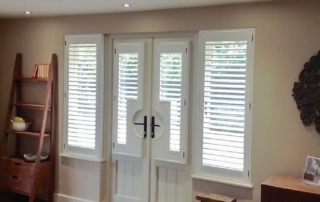 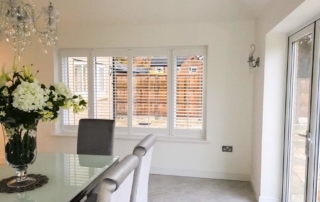 French doors can have shutters attached directly to them with a custom designed handle cut out (only available in one of our premium timber ranges) they will allow easy access without the need to bi-fold panels.